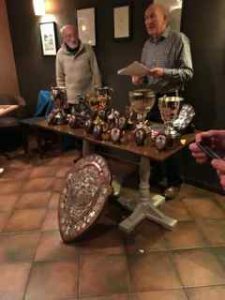 The 2018 HCC Anual Awards Ceremony was held at Abbeys Bar/Portals Place on 10th January 2019. All members and guests were treated to drinks and a top class hot and cold buffet. 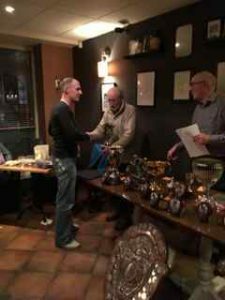 Thanks to all for attending – it was a full house and a fitting finale to the 2018 season where many HCC cyclists were successful in Teesside, North and National levels. Opening address was given by Paul Garstang , who thanked all attendess with special thanks to Mrs Russell and John and Doreen Lyth. Thankfully no major accidents this year. 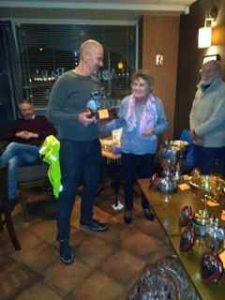 Special note was made of Richard Booth’s on going acheivements in the Veteran Road Racing endeavours. 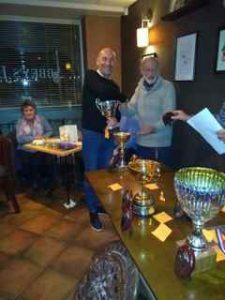 Paul Fountain and Paul Thirling for winning the respective age categories in the Teesside SPOCO league, Phil Wright for the Fastest plus 50 mile TT on Standard in the North Area VTTA and Andrew Wilson for acheiving Standard 10 mile TT in Norh VTTA. 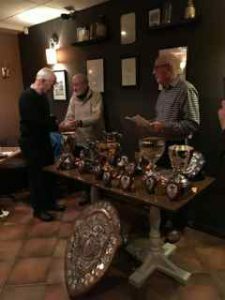 Finally the 4 participants on the 100 in 8 over Bollyhope who received medals of achievement, Trevor Jones,Andrew Wilson,Paul Garstang and Phil Wright. 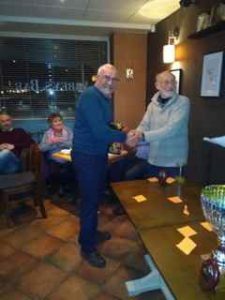 John Lyth and John Grant presented the awards. Thanks to all the Management and Staff of Abbeys Bar / Portals Place, dont think it could have gone any better – see you all next year , hopefully. All top quality Velotec made in Italia. Contact Phil on jagryk@aol.com or 07702 244922 for further details. All Club members and any prospective new ones . Announcement of date for HCC’s anual 100 in 8 over Bollyhope. 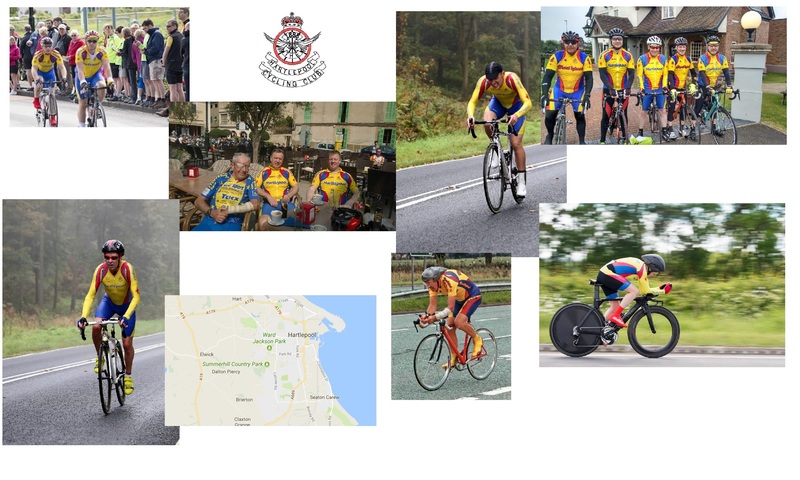 It is to be 3rd March 2019, support car kinidly donated by Phil and driven by John (thanks for offering) Medals will be awarded to all persons completing this ardous task. Pray for mild weather. 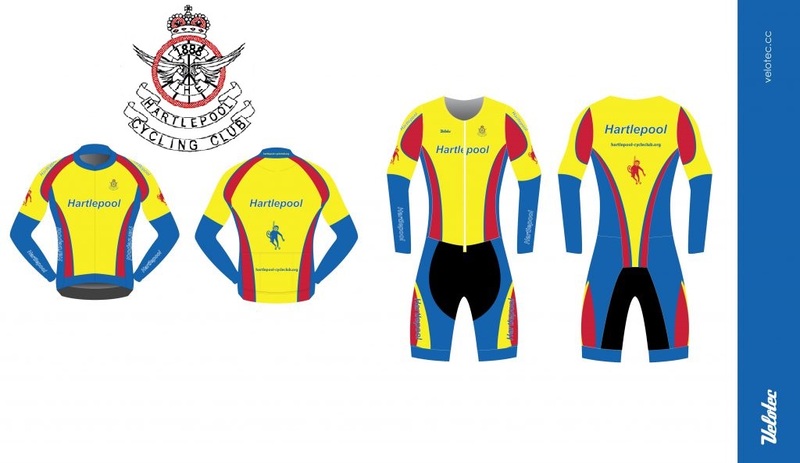 Hartlepool CC are promoting their last Time Trial of the season on the ” user friendly” course T254 near Leeming on 16th September 2018 . Please see the attached details. 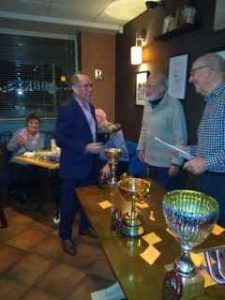 As always we are indepted to the volunteers who make these events possible, which in turn provides some financial assistance to the club to arrange prize presentation, assistance to racing costs and assistance to club kit purchase. If anyone would like to assist please contact Paul or Phil as per the attachment. Closing date for entries is midnight 4th September 2018 via the CTT website or give Phil a call on 07702 244922. Well after all that preparation, the weather finally defeated us. The race was called off on safety grounds – the spray created by traffic in the Northern Sector of the course was hazardous to any rider. Many thanks to all involved : Mark, Paul, Jason and Derek who were down to Marshal the turn, Neil who was to Marshal the slip road to the finish. Paul and Andrew for pushing off. John who was due to number catch, John who was the result board man. Phil and David for timekeeping duties and finally but certainly not least Ruth and Janet for catering – who in fact where the only ones to do any graft. 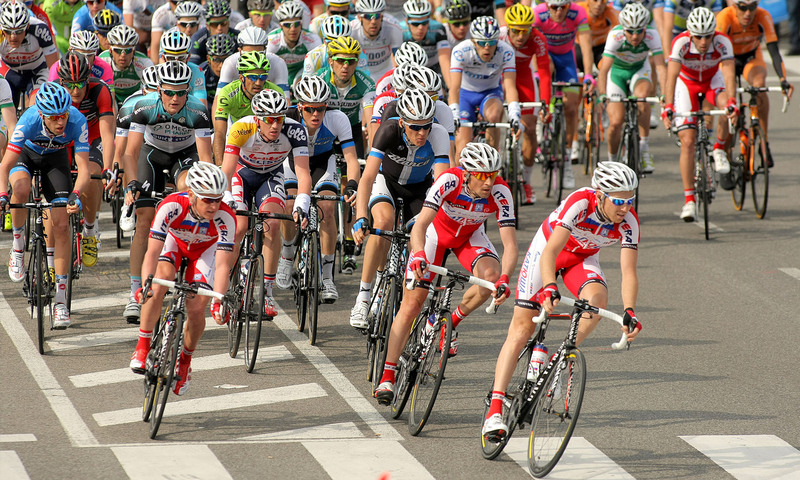 Thanks to all riders for entering this event, we had a very strong field of 95. Apologies to anyone who I may have missed and there is bound to be someone, but I am a little frazzled after this morning. Lets hope the weather is better for our final event of the season the T254 16th September first rider off 09:01 get your entries in please. Please note entry for HCC’s 50 mile TT on 12/08/2017 is closing at midnight on 31st July 2018. 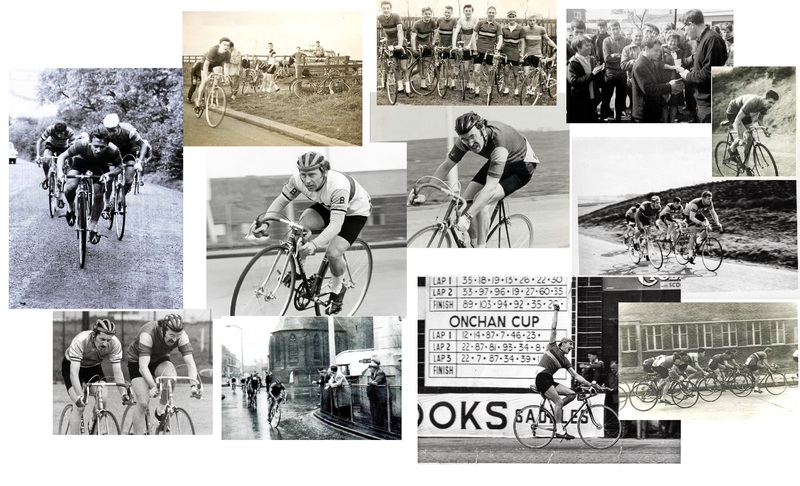 All HCC members who are not riding in this event and who would be available to Marshall or assist with the running of the event will be suitably reimbursed for any expenses incurred in getting to/from Crathorne. Travel will be arranged for those marshalling at the turn. Please contact Phil Wright 07702 244922 or Paul Garstang 07784 781221, Thanks in anticipation.